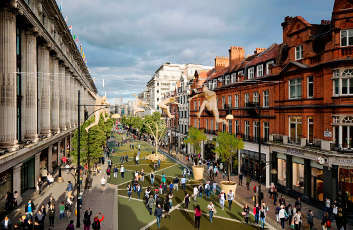 The mayor’s office said the plans, which are now subject to consultation, would turn the area into the world’s best outdoor shopping experience and ‘create new traffic-free public spaces in the heart of London to rival other world cities such as Paris and New York’. 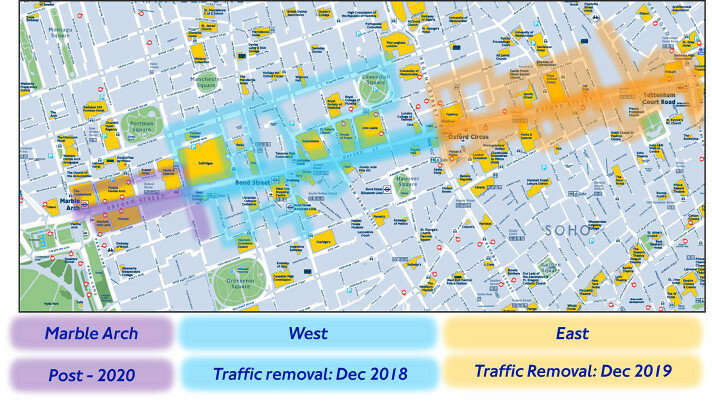 The proposals would see all east-west traffic restricted from entering Oxford Street between Orchard Street and Oxford Circus, while maintaining north-south routes through that section. The carriageway would be raised to be level with the existing pavements, making the area more accessible. This first stage scheme, covering ‘Oxford Street West’, aims to coincide with launch of Elizabeth line (Crossrail) services through central London in December 2018. Under the plans, new seating would be placed along the street while a new 800m-long work of public art could also be commissioned for the length of the former carriageway, ‘acting as a centrepiece for the transformed street’. TfL has been working since summer 2016 to reduce the number of buses operating along Oxford Street by 40%. With the opening of the Elizabeth line, this number would be reduced further. New and extended taxi ranks would be created close to Oxford Street to allow black cabs to continue to pick up and drop off. The mayor’s office said that while cyclists would need to dismount when travelling along this section of Oxford Street, TfL and Westminster City Council are committed to providing cycling improvements in the surrounding area, with a consultation on new cycle routes along quieter roads to the north and south of Oxford Street due in Summer 2018. A consultation on the plans for Oxford Street West runs until 17 December 2017.